We’d walked eleven kilometres and were ready to refuel. We’d planned it so that the half way mark of our route would be in a small town. The problem was that there seemed to be a lack of places to actually rest our weary bones and eat. A street-sweeper rested in the shade of a pretty, whitewashed church. “Is there anywhere nearby to buy a bocadillo?” Andy asked him. Betancuria was about fifteen kilometres away… and we were on foot. By day two on Fuerteventura we realised once you move away from resort areas there simply weren’t the same local gastronomic choices as found on some of the more populated Canary Islands. On Tenerife and Gran Canaria, a large Canario population means that every decent sized town has a reasonable amount of restaurants. In fact some of the best restaurants are virtually unknown to visitors. Fuerteventura is different. The Canarian population is outnumbered by the international ex-pat one and towns inland are little more than villages. 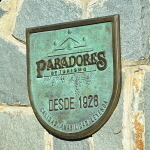 The ones with the most restaurants generally tend to be on the tourist excursion trail. As for the gastronomy, it’s much like that found across the other Canary Islands – stews and simple grilled meat/fish dishes. When we asked what the Fuerteventura specific specialities were there tended to be a bit of head scratching once we’d ticked off goat cheese and cabrito (kid). 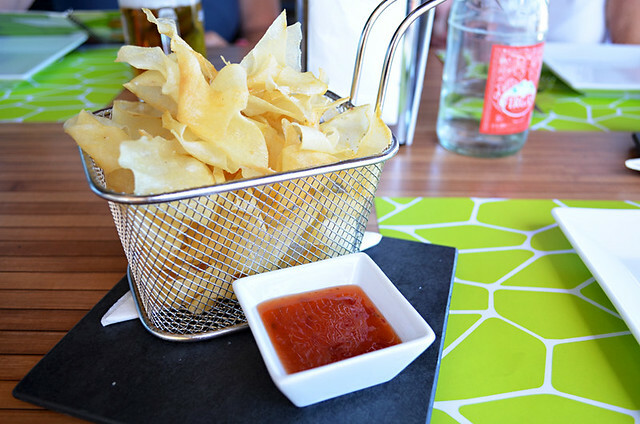 Saying that, as we walked our way across Fuerteventura we found a stomach-pleasing mix of restaurants and cafés that offered a mix of cheap and cheerful, upmarket traditional and occasionally even creative cuisine. Over eleven days we ate in twelve different locations; none of them resorts. The immaculate historic town boasts a good selection of restaurants – all aimed at the transient tourist market. Prices are higher as a result but they are located in attractive traditional houses, often with leafy courtyards or shady terraces. We chose the pretty courtyard of Bodegón Don Carmelo due to the fact its prices didn’t seem quite so elevated. Three tapas for €10 seemed decent value. 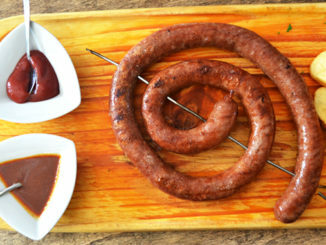 As it turned out, it was better than decent as the tapas are a lot bigger than the ‘examples’ exhibited beneath a glass case. 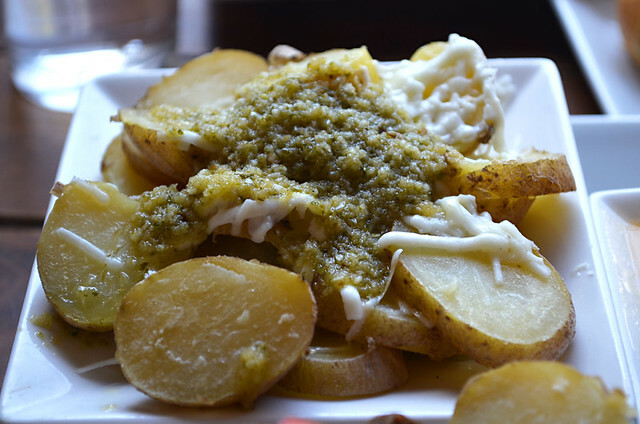 Tapas are traditional Canarian (nice touch to have Canarian wrinkled potatoes with cheese and mojo verde) whilst salads are particularly creative and tasty. 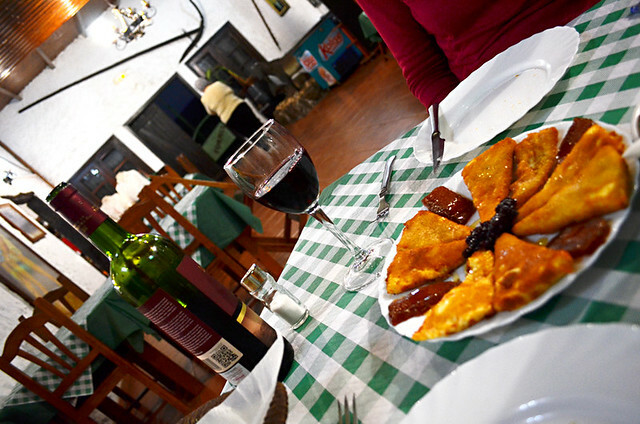 An authentic Canarian town with cafés and restaurants catering for the local population. Subsequently prices are cheap as papas fritas. There are no frills at any of the restaurants. Los Girasoles is a popular hang out to meet friends and have a drink over a pizza or burger. However, Bar Noria felt like the focal point of the community. Energetic owner Inma did everything from pouring drinks, cooking the food and even driving us home in the rain, leaving customers in the bar without anyone to serve them. It’s a tapas bar with the tapas being whatever is available. We liked it a lot. You can’t argue with €15 for three generous tapas, a bottle of wine and a lift home. Restaurant Don Antonio stands out on Fuerteventura. It’s a delightfully charming restaurant in what is little more than a hamlet. The prices are on the high side, nearly €16 per person for the tapas for two, but what you get are quality tapas that are a bit different from other places. Plus being presented with a tapas tower is quite a wow. We only had a couple of bocadillos at the Restaurant Centro Cultural in Pájara but Victoria, owner of Hotel Rural Era de la Corte, said it was one of her favourite places for cabrito. Unfortunately we didn’t find this out till after we visited. Just along the road from Antigua is Casa Matoso, probably one of the best in the area. During the day the rustic restaurant caters for small scale tourist excursions but after dark it is 100% local. We had the goat (Matoso is another of Victoria’s favourite restaurants for cabrito), spiced pork and fried goats’ cheese with blackcurrant that had an ‘off the scale’ yum factor. Big portions at local prices. 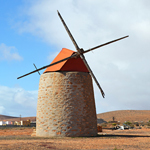 Gran Tarajal is one of the few good-sized coastal towns that feels authentically Fuerteventura. We took to the place right away and Tapaventura on the promenade convinced us that this was a town we wouldn’t mind spending more time in. The tapas were a refreshing mix of creative and traditional which caused a bit of head scratching whilst decisions were painfully made. In the end we went for sweet potato crisps, fried aubergine, tiny fried squids and carajacas (liver); a dish you find more on the eastern Canary Islands. Again, prices reflected the Canarian nature of the town so you got a lot more for your dosh than in resort areas. There are a few decent traditional café/restaurants in Tiscamanita. 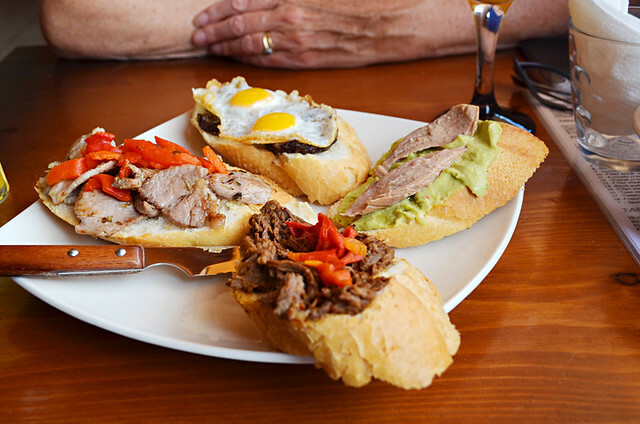 We chose Tio Pepe as we only wanted a bocadillo. Oddly, for a Canary Island, you get strange looks in some places on Fuerteventura if you ask for a bocadillo. Restaurants in Ajuy in particular seemed to only want to palm us off with a full three courses option. 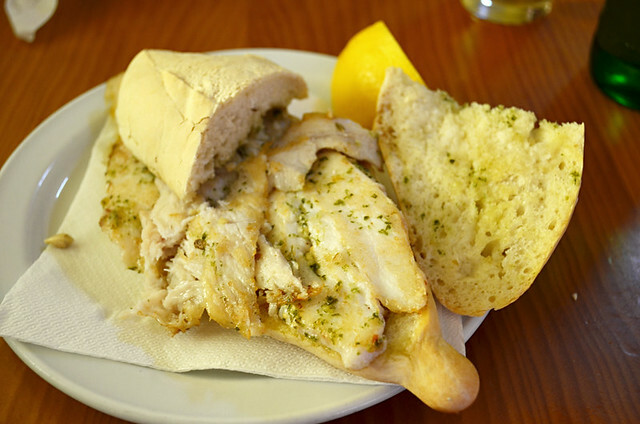 Tio Pepe was great – a cosy little bar restaurant where a fish bocadillo meant a proper fillet of fish in a baguette. 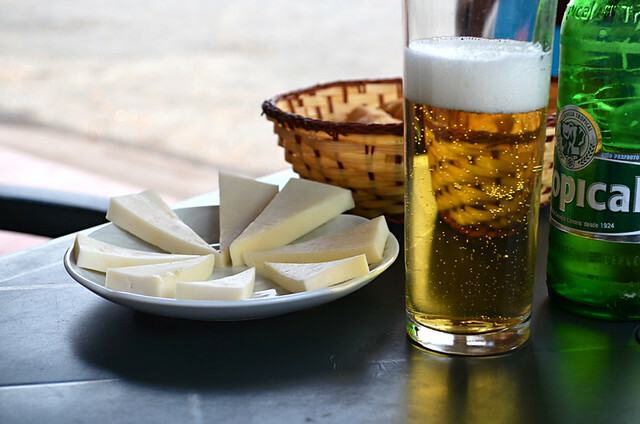 Located in a little hamlet that’s more like a farmyard, Bar Garcia is convenient for a break when travelling south to north. 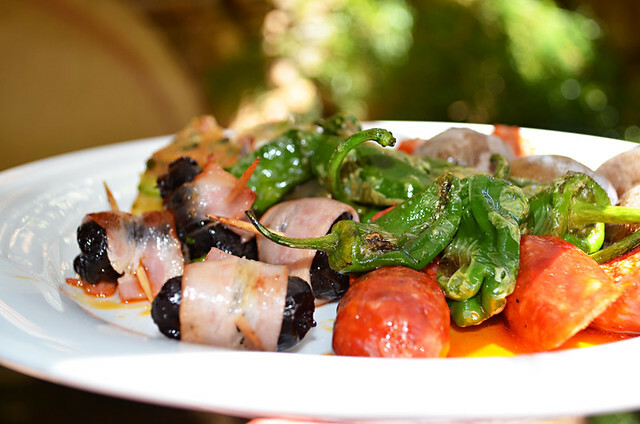 The menu is much the same as everywhere else and they serve basic tapas and snacks. Rustically friendly with a goat, donkey, turkey soundtrack. 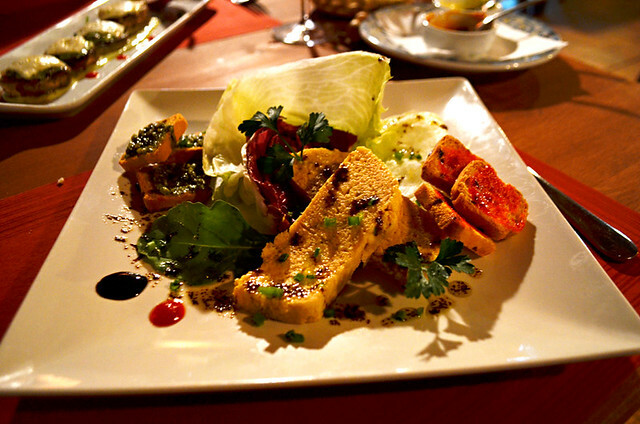 Villaverde offers what is as close to a restaurant district as you’ll find inland on Fuerteventura. The menu at the restaurant in the Hotel Rural Casa Vieja is an international/Mediterranean mix with big portions that go down well with diners. Whilst Casa Vieja offered a break from the basic traditional fare, we preferred the restaurant at Rural Hotel Mahoh just up the road. At night, this casual Canarian rural hotel transforms into a hugely professional restaurant. 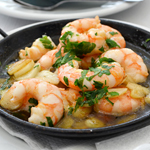 Dishes are Spanish and Canarian, prepared and presented with enticing flair. Both restaurants are on the pricey side. 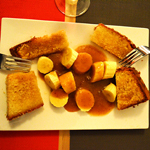 El Horno, near the centre of Villaverde, is less expensive and serves big portions of good quality, traditional food. Lajares is a nouveau Fuerteventura town with a unique personality. A resident half joked it was the most international town in the Canary Islands. It exudes an arty, bohemian, surf town vibe – strange considering it’s not on the coast. 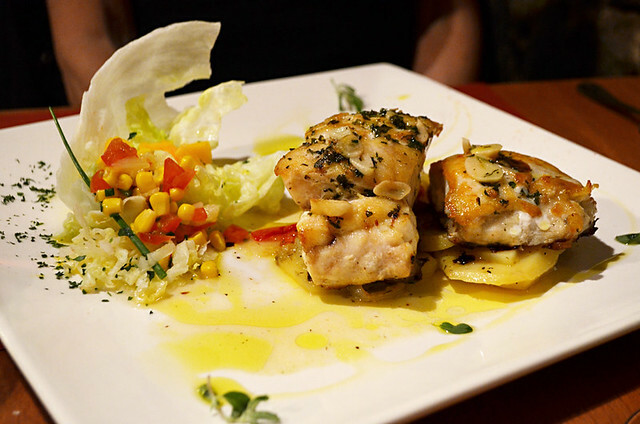 Lajares also boasts an imaginative range of restaurants that you simply don’t find anywhere else inland. We liked the atmosphere there and ate in town twice. The first was at the Canela Café which did delicious wraps and looked as though it would a great place to hang out at night. 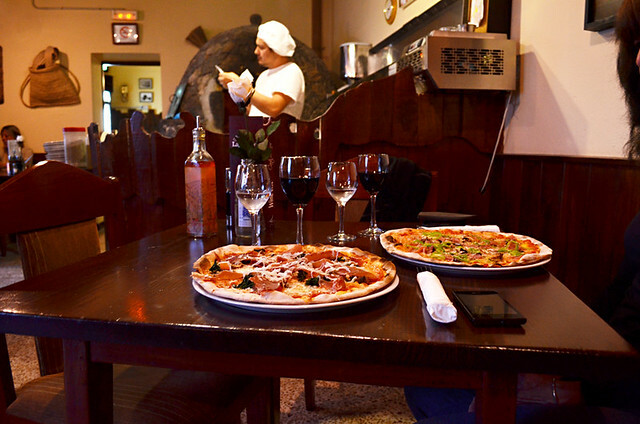 Second was at the La Cancela Pizzeria where gigantic pizzas are prepared in front of diners and cooked to perfection in a traditional Fuerteventura oven – the waitress checks the bottom of each pizza before serving. El Cotillo also has a surf dude vibe but the best part, around the old harbour, is concealed by bland buildings. We missed its charm last time we were on Fuerteventura but this time we fell under its spell thanks to advice from local walking guide Andreas, who we hooked up with for a day. There are a few interesting restaurants in El Cotillo and we particularly liked the culinary scene around the fishermen sculpture. 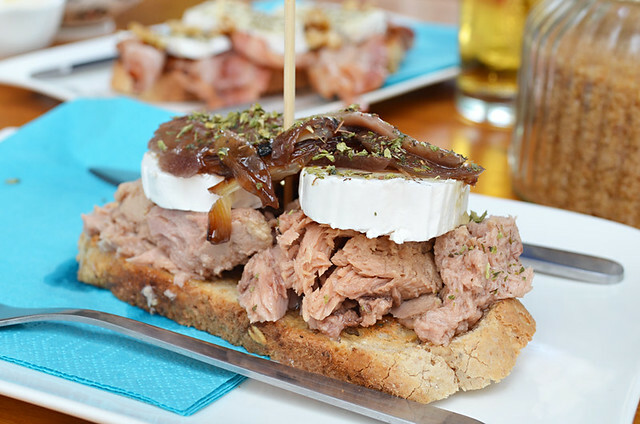 Puerto Dulce, with jazzy sounds and a menu that had us drooling, was our sort of place – hummus followed by two big montaditos of bacon, brie and nuts for Andy and goat cheese, caramelised onions, anchovies and tuna for me. They also have irresistible carrot cakes. Fuerteventura’s capital stays mainly off the tourist trail which, like Gran Tarajal, gives it a more authentic feel than many other coastal towns. El Perenquén, overlooking the port, is a wonderful restaurant with an amiable waitress who had time for everyone. Every dish that came out of the kitchen had a ‘I want to try that’ factor. 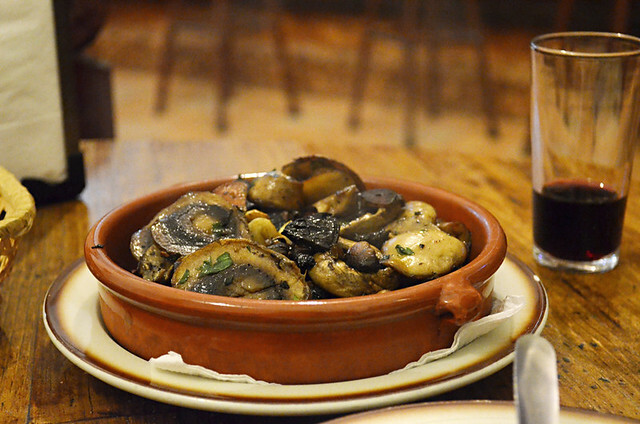 Although we coveted the food on other tables, we were pleased as punch with our selection of montaditos. All were fab with morcilla with quail eggs and tuna on a bed of creamy avocado both deserving special mentions in dispatches. Had we stuck with traditional cuisine we’d have become bored with the food quite quickly on Fuerteventura. Moving around regularly combined with trying a mix of conventional and creative cuisine, plus occasionally eating ‘big’ during the day and ‘small’ at night, meant we were able to enjoy a more diverse gastronomic experience of the island.